U.S. Frozen Bakery Market size is forecast to exceed USD 9.3 billion; according to a new research report by Global Market Insights. The busy and fast-moving lifestyle has increased the demand for convenience food products in the United States. There are several factors which are responsible for driving growth of convenience foods market demand. According to studies conducted by IFT, Americans are preferring processed food over freshly baked ones, which has drastically reduced the food product prices over past few years. Another factor responsible for driving convenience food demand is hectic lifestyle, consumers are preferring food products which are ready to eat or take less time to cook or bake. Between 1999 and 2015, changes in food expenditure habits of consumers drove most of the food-buying patterns. Quick service restaurants were also responsive to these changes through their advertising expenditures. Retail industry is a major growth driver for frozen bakery market size in the recent years. Retail industry ensures the easy availability of the products to the customers. Many times, frozen bakery products are bought out of impulse buying, that time easy availability of the product is crucial. The United States has a well-established distribution channels for all types of retail companies. According to Forbes, total sales from the retail industry was USD 3.53 trillion in 2017. U.S. government have reduced the corporate tax which will propel the retail industry growth in country over the next few years. Now economic condition in U.S. is improving and inflation rate in the country is stable, owing to this consumer spending has increased swiftly from past few years. This increased consumer spending will accelerate the retail industry growth during the forecast period, which shall subsequently propel U.S. frozen bakery market size by 2024. Consumers are continuously looking out for improved, healthier, and quicker ways to buy bread and baked food products at their convenience and price. As busy work schedules are leaving little time for people to prepare proper meals, bread and baked snack products such as wraps, burgers, sandwiches, and rolls have become an easy alternative to regular meals. However, these food products have always been targeted as the root of many health problems and thus, consumers’ preferences are changing rapidly towards natural and healthier food. This may hamper frozen bakery market size growth during the forecast period. 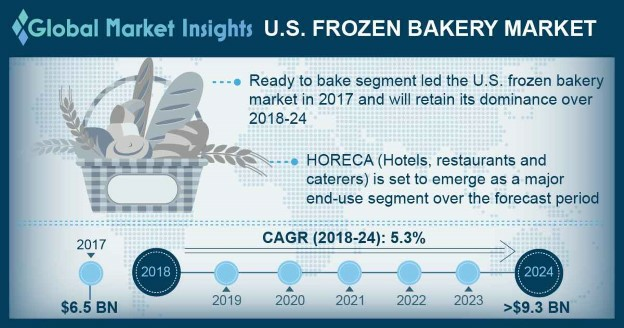 HORECA is an important end-user segment which will be experiencing exponential growth in U.S. frozen bakery market over the forecast timespan. Hotels, restaurants, food trucks, catering business buy frozen dough in bulk quantities and process them for making a large variety of frozen bakery products for ready to bake purposes or in fully baked formats for customers. The rapidly growing hospitality business in the U.S. will be majorly propelling U.S. frozen bakery market during the forecast timeframe. Ready to bake food products are more popular amongst the working-class people as they hardly find time to cook food due to their busy lifestyle. To expand the market among these consumers, ready to bake food producers are focusing on providing affordable products. These products are majorly used by restaurants and hotels, as the chefs get time to focus more on the dish’s decoration and garnishing. It was the largest product segment in 2017 in the U.S. frozen bakery market and will grow with highest CAGR from 2018 to 2024.